When it comes to mobile phones, the iPhone seems to stand strong like a lone warrior against a seemingly endless horde of smartphones. But is it really worth the hype? Of late, there has been an army of formidable Android phones, which can do everything that the iPhone can do, and at times do it even better. As a mobile operating system, Android has matured a lot and is maturing more and has achieved the polished finesse of iOS. 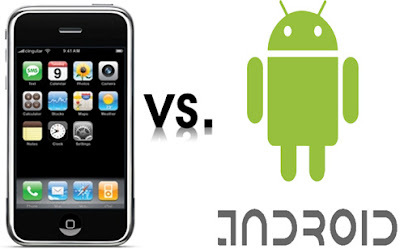 When it comes to a buying decision, here is how I would go about choosing between the iPhone and the Android phones - I would go straight for an Android phone, and here is why. Android phones are almost universally available, unlike the iPhone, which is available only at Apple Stores and a select few stores. Also, nearly all Android phones are available almost instantly in India when they are launched worldwide, but the iPhone is available usually after a year, when it is already too old. iPhone has been notorious for usually being sold with a network lock - it works only with one mobile service provider to which it is subscribed, and fails to register a SIM card of another provider. Android phones do not have such restrictions and the users are free to use any network of their choice. It has become a frustrating annual ritual - a new iPhone is launched, it is priced exorbitantly and is pretty much out of reach for most consumers. Android phones, on the other hand, are a mixed bag as far as price is concerned, as there are so many of them that almost every price segment is covered and you can choose the Android phone that suits your wallet. Unlike the screen of the iPhone that is littered with icons, Android phones have desktops with widgets with an actual purpose, giving you information at the flick of a finger. As an example, Data Counter widget instantly displays data usage to check your internet usage, while Twitter widget keeps you updated with your Twitter account's status. Take a look at this article to know what I mean. iPhone requires you to install iTunes on your computer and sync with it in order to do just about anything on the iPhone, such as transferring applications, music, videos or contacts. Furthermore, you can sync it with only a limited number of computers. Android phones do not need any such application - simply plug the phone into any computer and exercise complete control over your phone. Data transfer is as easy as drag and drop. On a side note, I deem the SD card expandable memory option in the Android phone to be better than having no memory slot as in the iPhone, because you can carry additional memory cards with you and use when required without worrying about running out of memory. You can instantly switch on or off Bluetooth, Wi-Fi, Mobile Network or GPS on the Android phone by simply clicking on the provided buttons on the desktop. This goes a long way in conserving battery life. In the iPhone, you have to dig deep into the settings to be able to enable or disable these features. The web browser on the Android phone is simply amazing. To know what I mean, you have to use and experience it. It is faster than Safari, has every feature that you expect from a web browser, and supports Flash. Being an operating system developed by Google, as expected Google is integrated deep into the heart of Android. Thus, if you want to search Google, simply enter the search button and enter your search string and the results appear swiftly. Of course, the browsing experience varies with the speed of the processor inside the Android phone, which means that you will get the best browsing experience on the more expensive phones. Also, we must mention here that the web browser on the iPhone 4 is supposed to be the best around, but we don't get the iPhone 4 here in India and even if we were to import it, it is too expensive. There is also a Google Voice app for Android. In the iPhone, there is a very limited notification system. For example, if you are a Twitter user, then you need to open the Twitter app to find the updates. n Android phones, notifications are better organized. These apps can access the notification system of the operating system and alert you on the notification bar to a new email, voice message, and Twitter or Facebook notification, in addition to SMS. The application runs in the background and you do not need to open it to find out the status. Just like the App store from Apple, there are thousands of apps for Android available in the Android Market. Just about every iPhone app has an equivalent, which is usually free. The good thing is that you need not sign into your account every time you want to install an app from the Market, even if the app is free. And yes, Market has more liberal censorship laws for Android apps - Google does not play the moral police. Android phones can be personalized the way you want. Thus, you can make the phone appear the way you want, and behave the way you wish. Depending on what type of user you are, you can configure each desktop to serve your needs. If you are a business user, you may want a screen with contacts, emails, stocks and news updates via RSS, etc. A social network user may want to have a Facebook desktop, a Twitter desktop, and so on. You can even add a whole new desktop if you want and set default actions for different contacts. This is not possible on the iPhone. Updating the operating system on an older iPhone such as installing iOS 4 on the iPhone 3G, usually results in a much slower performance, forcing me think whether it is a ploy by Apple to force you into buying their newer iPhone. Forget about preventing the OS being updated in older devices after a certain version, Apple does not even have the courtesy of warning the users against the ill effects of updating the OS on older devices. Android on the other hand, has been seen to actually make the phones work faster with the updated OS. Better still, to avoid any problems as we have seen in the previous example, a trend has been seen where most Android phone manufacturers play safe by setting a limit that an Android phone can update its OS only twice in its lifetime. Some of the above limitations can be overcome by Jailbreaking the iPhone, but then would you risk voiding the warranty on such an expensive device? I wouldn't. So there you are, these are good enough reasons for me to decide to go for an Android phone. Please let me know your views in the comments section below. Thats right,i gree with u.